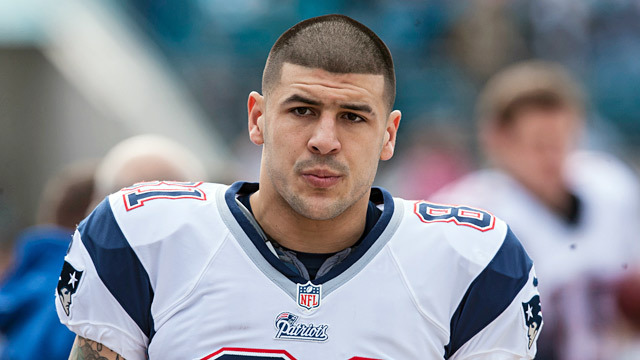 Investigators searched the North Attleborough home of New England Patriots tight end Aaron Hernandez today following the killing of a man police call an "associate" of Hernandez, ABC News has learned. Two Hernandez friends tried to leave house at the time of the search, but they were stopped by a state police car at the end of driveway. Crime scene investigators later searched the car the men tried to leave in. During the search, Hernandez received a hand-delivered package from the prominent law firm Ropes and Gray around 7:30 p.m., with the deliveryman telling reporters swarming the sidewalk outside that it was addressed to "Mr. Hernandez himself." Hernandez was initially uncooperative with police after the body of a 27-year-old man was found in an industrial park not far from the Patriots player's home, two law enforcement sources said. A rental vehicle with Rhode Island plates was recovered near the scene, which led investigators to Hernandez, sources told ABC News. Bristol County District Attorney Sam Sutter confirmed in a media statement that a body was found around 5:30 p.m. Monday in a clearing near John Dietsch Boulevard. Sutter said that based on the "nature and circumstances" of the body that the investigation would be handed over to Massachusetts State Police detectives. North Attleborough is home to many Patriots players because of its proximity to Gillette Stadium, where the Patriots play. In fact, Hernandez bought his home from a former Patriots player, Ty Warren. Neighbors expressed concern outside of the house as it was searched. One, Jill Cambridge, 43, wore a Patriots jersey as she defended the star tight end. "I think the kids around here, especially, look up to the Patriots players," she said. "I just hope he's not involved in this." Another neighbor, Susan Mayer, and her 14-year-old daughter, Rachel, described Hernandez as a very warm guy. "There is a lot of action around here because of the Patriots,'' Susan Mayer said. She added that Hernandez, along with Matt Light and other Patriots standouts, hosted a haunted house and scared dozens of kids while dressed up in costumes last Halloween. Stacey James, a New England Patriots official, said on behalf of the team, "I am aware of the reports, but I do not anticipate that we will be commenting publicly during an ongoing police investigation." Hernandez is spending the off-season recovering from a shoulder scope, though he was spotted at practice recently welcoming new Patriots' quarterback Tim Tebow.